Weâ€™ve just announced that we have named Tech Solutions + Sales of Carmel, IN as our newest Manufacturers Representative to offer the exacqVision NDVR line of products in Indiana and Kentucky. A case in point is the search result ribbon.Â Three simple, intuitive icons: save picture, save video clip,Â and print picture.Â Download the exacqVision client software here if you want to experience the user interface of this powerful network DVR. At this week’s NACStech show in Nashville, technology innovations designed to streamline how the convenience and petroleum industry operates were the main focus. Of key interest were the latest in POS technology and the integration of POS with all aspects of the convenience store operation, including digital video security systems. In the closing session, Dan Hopping, CEO of Next Retail Group said that new technology payment methods, including RFID availability, windshield transmitters, key fobs, cell phones and iButton, combined with new security technologies, including eye scanners, fingerprint readers, face, voice and signature recognition, will usher in greater profitability. exacqVision is ahead of this curve, with open integration with a wide variety of POS and transactional products, as well as integration with access control, video analytic and and biometric products. 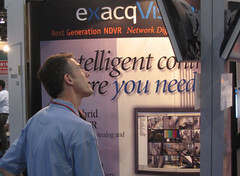 exacqVision systems range from IP camera-only solutions to hybrid performance systems. 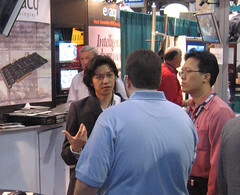 We attended the Retail Systems show in Chicago yesterday. There was a big focus on Linux in Retail. Data Centers, POS, and video loss prevention products are migrating towards Linux. This is an ideal fit for exacqVision, as we designed it to be cross-platform: both Linux and Windows. ExacqVision merges completely with POS systems, and it ties into video analysis products for loss prevention, asset tracking, people counting. The addition of IP cameras and remote viewing and storage make exacqVision a good choice for retail loss prevention applications. An end-of-day report from the show organizers entitled â€œOpen Source Gaining Ground in Retail POSâ€ discussed Sunday’s Linux in Retail Symposium, where panelists said more retailers are switching to Linux as an IT platform based upon its added flexibility and stability capabilities. Linux is helping retailers innovate and upgrade their IT infrastructures, while cutting TCO and improving security. With Linux, retailers gain the power and flexibility to choose best-of-breed systems for each area of the retail infrastructure – from POS machines to headquarter servers to digital video security systems such as exacqVision. Linux helps keep POS systems from crashing as often, which keeps customers happy and lines moving. According to IHL Consulting Group, Linux saw growth in POS last year, with a market share that was double what it was in 2004. 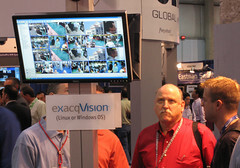 Version 1.0.0.33 of the exacqVision client was released today. There is some functionality refinement on the Search page, including the showing of disabled video inputs, as well as cursor time in the Search Ruler Bar. Other functionality improvements include new POS Profile font selections, and some updated icons. 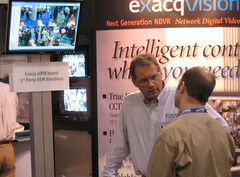 The exacqVision client software can be downloaded here. We’re pleased to announce that we have named ASR Enterprises of Downingtown, PA as our newest Manufacturers Representative to offer the exacqVision NDVR line of products in the Middle Atlantic Region. This area includes Eastern Pennsylvania, Southern New Jersey, Maryland, Virginia and Delaware. We’re getting the exacqVision systems ready to ship to Las Vegas for the upcoming ISC West show, April 5-7, at the Sands Convention Center. If you’re going to the show, come by and see us at booth #3127. The exacqblog is coming.Â We’re working hard to get our new exacqVision NDVR digital video surveillance products released.Â We will be blogging our progress, and we’ll have commentary by the engineers designing the product.Â Stay tuned!